Escape rooms are bringing multisensory experiences to the masses. The hard part is informing the public about them. Being locked in a room for an hour – sometimes with total strangers – doesn’t sound like an activity that would warrant ponying up a well-earned $25 to $30. Yet the millions of players that have caught the "escape room bug" would beg to differ. 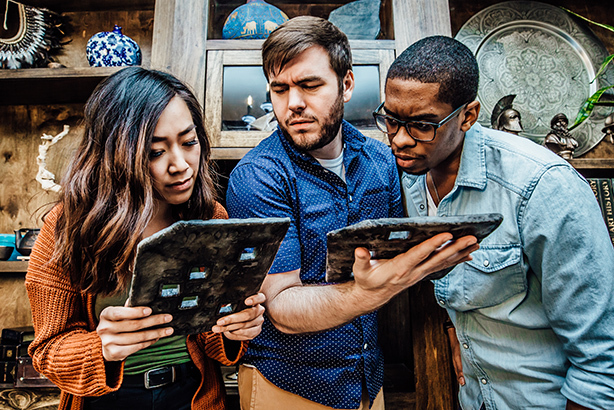 Escape rooms are immersive adventure games in which a group of people must work together to solve puzzles or riddles in a limited time to leave the room. They can range in difficulty level and often have themes such as an art heist or espionage. The idea in its current form originated in Japan but quickly caught on around the world. There were 22 escape rooms in the U.S. in 2014, according to the Room Escape Artist blog database. By mid-2018, that number had ballooned to 2,300. Although puzzle games have long been a staple in American households, the main hurdle facing the escape room industry is educating consumers. Many are still in the dark about what the concept is, especially in the U.S., where it’s relatively new. "If I tell you, ‘Let’s go to a film, bowling, or paintball,’ you already know what it is," says Escape Hotel cofounder Ivan Leon. "A lot of people automatically associate escape rooms with haunted houses, fun houses, or mazes. It’s an experience very far from that." Another challenge is finding and training staff. The newness of the industry means "game masters" aren’t as easy to come by as bartenders, for example. That’s where Leon and cofounders Kitti Herczeg and Ion Beroiz come in. Their education in film, as well as backgrounds in the entertainment and restaurant business, helped build the framework for the 10-room Escape Hotel, "the largest escape room in the U.S.," according to Los Angeles news and lifestyle site LAist. "I worked in advertising for several years with one of my partners," says Leon. "All of that came in very handy in making our brand look the way it looks. Everything you see in Escape Hotel – photography, videos, games, and props – is done by the three of us." The venue also has a café where visitors can mingle and chat about their experiences. "We want it to be an experience as soon as you enter our building," Leon emphasizes. "Our employees are in character wearing costume and makeup. Nobody has made that approach so far. We have sound and light effects cued by [our staff]." Leon "doesn’t like to talk about numbers" but says Escape Hotel is "doing well." "When we started the project, there were two sets of investors that are partners with equity in the company," he explains. "They don’t say much with regard to what we do and how we do it. The business is self-sustainable from the day it opened." The venue is cementing itself on the iconic Hollywood Boulevard, which means a large part of its clientele is tourists. By contrast, The Escape Game has a broader market, according to marketing manager Max Magura. Billed as "America’s No. 1 escape room," it offers 60-minute adventures in eight U.S. cities, including Austin, Chicago, Orlando, and Nashville. "Speaking to the people in each of those markets is a little bit different," notes Magura. "But unlike some escape rooms that are geared toward enthusiasts, ours is more mass appeal. We want the 12-year-old that’s celebrating a birthday to the businessman in Chicago to the bachelorette party in Nashville to all know they’re going to have an epic adventure." Magura can’t share any exact sales numbers but notes, "We are up in every market each year." The average escape room generates 63% of its booking revenue from its website, according to online booking system Xola. For some companies, digital marketing has also proven to be an effective strategy for increasing sales. Breakout Games, which has 45 locations in 28 states, focuses its efforts on online sales, especially during the holiday period. In fact, the biggest seasons for promoting its escape rooms are the summer and holidays, according to marketing director Cassie Dilly. "This focuses mostly on when families are able to spend a lot more time together and when college and high school students are not in school," says Dilly. "We start advertising gift vouchers the week before Thanksgiving, then hold a promotion until midnight on Christmas Eve." "Our first time trying out [holiday vouchers and discounting] was in 2017," she recalls. "We discounted gift cards and saw great results. We found people were happy to schedule family time and give the gift of togetherness at a later date." Dilly says Breakout Games "has seen a jump almost 25% in sales from a slower period to our holiday period." The Escape Game has also done a big holiday push online and in-store that incorporated significant discounts. "A fun [deal] we do around Valentine’s Day is called a third wheel deal: You buy two gift cards and get one free. If you’re in a relationship and have a regular third wheel with you, all three can play The Escape Game," notes Magura. "It’s a tongue-in-cheek kind of thing to do. It’s not your typical gift card, where someone has to go to a big box retailer or online and it seems a little generic. Your end gift is the gift of adventure." Creating original content is key to building a brand’s presence online, especially through social media. For Breakout Games, earned and owned media is 60% of the marketing mix. "A lot of what we do is interact as a brand with our social followers," Dilly stresses. "We create content focused on providing an experience in a smaller form: riddles, charades, and different puzzles they get to solve on our channels. That creates a strong engagement because we are giving something to customers to interact with and not just constantly flooding their channels with our product. The 60% is about being present in our communities, stores, and social channels." Paid media is where the company "focuses on leaning into analytics and SEO, and learning how to best use ads, whether that be on Google, Bing, or Facebook," she says. Breakout Games, which works with See Spark Go as its PR AOR, did its first large experiential promo this past summer, using #breakouthunt to create buzz. The company organized 25 treasure hunts nationwide, hiding 20 $100 bills in each city and releasing coordinates on social media that hinted at their location. "We ended up having over 10,000 people participate in some locations, including Greenville, South Carolina," Dilly explained. "It started getting coverage from news stations in places we don’t even have a Breakout Games, such as Bakersville, California." She notes the activation "was a way to bring the experience we offer in our escape rooms to the streets to all people, whether or not they come in through our doors." Magura uses social primarily to re-engage with The Escape Game’s customers. To that end, the brand developed a monthly mystery game on its website, promoting it on social with videos and encouraging followers to tag their friends. Players have a chance to win $1,000. "If they share the monthly mystery with their friends who might not have played The Escape Game before, it offers them a way to get to know our brand and what we’re about before stepping into our rooms," he explains. "November’s game was ‘off the grid.’ It picked up a lot of traction. We did a tech-oriented, elf hacker-themed game in December." Escape Hotel, which advertises on Instagram and Facebook, takes a different approach to social. "There are a lot of brands that make their products and branding focused toward ‘Will this work on social or not? Will this give me followers or not?’ whereas we think the other way. This is how we are going to do it because it’s the way we like it and the way we think it should be done," Leon says. "If it works on social, good. If not, we don’t care because it works on our customers." Escape Hotel’s brand partnerships included Tomb Raider, The Exorcist, and Jack Reacher. "We have built games for them and hosted events for big companies and films," Leon adds. Some companies have even hired Leon’s team to build escape rooms for their activations at San Diego Comic-Con. Magura’s team has also made use of thematic partnerships. "For South by Southwest 2017, we did a partnership with Fox when they were relaunching Prison Break," Magura explains. "Some of the stars of the show came to play and people got to do a Prison Break-themed room at our Austin location." When it comes to working with influencers or celebrities, Leon says Escape Hotel’s policy is to "let them play for free in exchange for posts" rather than partnering directly. Among the venue’s famous guests were Justin Bieber and Shia LaBeouf. Actress Millie Bobby Brown from Stranger Things is a regular. "Fortunately, we have some celebs that have come on their own and really enjoyed the experiences with us," says The Escape Game’s Magura. "One is Tennessee Titans [defensive end] Jurrell Casey. [HGTV’s] the Property Brothers have visited the Nashville location multiple times, and [comedian] John Mulaney visited our Chicago location and posted on Instagram encouraging his followers to come visit." The post got 20,910 likes. Rather than partner with influencers, the Breakout Games’ main focus is on building a connection between its followers and marketing team using one of its own. "We have a fantastic creative manager on our marketing team, Colin [Perrier]," says Dilly. "He’s the face of all our content doing the goofy charades on the couch and informing you there’s discounted holiday gift cards. He’s been the strong creative force behind this since the beginning, and we’ve found having a consistent, relatable person on the screen [always gets good engagement] – the games get great interaction." Looking ahead, all the escape room brands are bullish about growth despite increased competition in the market. Dilly says Breakout Games is focused on improving existing locations. "In Baltimore alone, we’re doing an expansion project to create five more rooms in one location," she said. Others are looking to grow beyond their current venues. "In 2018, we’ve opened two locations and are excited to open two more in January, in Cincinnati and Jacksonville, Florida," The Escape Game’s Magura touts. "When we started two years ago, few people knew what escape rooms were," Escape Hotel’s Leon recalls. "We have big aspirations for franchising. We are very close, because we have the machine fine-tuned – it takes a lot of trial and error, as well as research in games, policies with employees, and protocols of how each person needs to execute their functions. There are plans to expand the brand not just nationwide but also internationally."